It seems unlikely that a soldier from the Civil War would have a child who is still alive. However, according to the United Daughters of the Confederacy (UDC) there are at least 10 ladies whose fathers fought for the South between 1861 and 1865. One of these is Johnston County’s Iva Lee Benson Gainey, a lifelong resident of the Benson area. 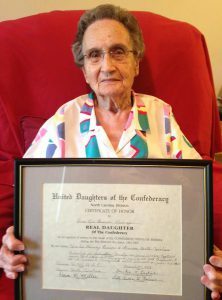 She will be recognized during a reception at the Johnston County Heritage Center in Smithfield this Saturday at 11:00 AM. “We call them ‘Real Daughters,’” says Patricia Gasson of Wilmington, who serves as President of the UDC’s North Carolina Division. “Our state actually has two – Mrs. Gainey and Mrs. Rachel Blackwell South of Eden.” Gainey is a member of the Johnston Pettigrew UDC Chapter in Raleigh, and South belongs to the Madison Mayodan Grays Chapter in Mayodan. Mrs. Gainey is the youngest child of Charles H. “Charlie” Benson (1844-1929), a private in the 24th North Carolina Regiment, Company I, organized at the beginning of the war as the Smithfield Light Infantry. Benson enlisted at age 20 and served alongside his brother, Sgt. William C. Benson, in the Army of Northern Virginia under General Robert E. Lee. By the time the war ended, both men had been captured by the enemy and were confined in a prisoner-of-war camp at Point Lookout, Maryland. Months after Lee’s surrender, they and scores of other Johnston County POW’s were finally given their freedom in exchange for signing an oath of allegiance to the United States of America. Emaciated and clothed in rags, they returned on foot to the homes they had fought to defend. The reception will be held in the Heritage Center’s Holding-Richardson Exhibit Hall and is open to the public.